The M&P M.A.G.I.C. Serrated Assisted Folding Knife from Smith & Wesson is a unique and highly functional design, ideal for everyday carry. The black-coated blade combines the strength and versatility of a partially-serrated edge with a heavy clip-point tip for durable cutting application and heavy-duty piercing. 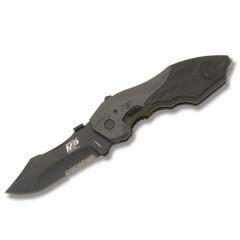 The blade deploys using Smith & Wesson's trademark M.A.G.I.C. assisted-opening mechanism, which provides rapid one-handed deployment. An external safety keeps the edge locked firmly in place, protecting fingers from the blade. The handle is made from black-finished aluminum with a Zytel® overlay and features a glass breaker tip at the base for emergency use. The folder includes a sturdy pocket clip for convenient portability.